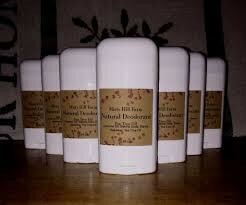 All natural deodorant is handcrafted using natural organic ingredients. Non toxic and soothing, our deodorant is formulated to promote living healthy, naturally. 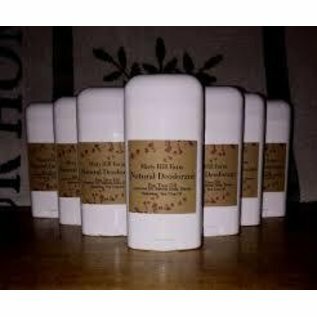 This natural, organic, homemade deodorant is Paraben and Aluminum free. These toxins can cause duct blockage and can lead to cancer. Sweating is a natural process of the human body and should not be inhibited. It rids the body of toxins and is necessary. This deodorant is not an antiperspirant. Studies have shown that using all natural, non toxic deodorant decreases the amount that a person actually sweats. Therefore there is an adjustment period that your body will have to go through through as these blocked ducts clear. Be patient as this transition can take up to two weeks. This deodorant lasts on average 2 -3 months. Ingredients: Baking Soda, Starch, Coconut Oil, Bees Wax, Tea Tree Oil and Essential Oil. "Welcome to Misty Hill Farm! We are a family run farm located in beautiful Temple NH. We specialize in offering quality handcrafted products from milk, yogurt, cheese and lotions to rustic handcrafted gifts. We have been farming for over ten years and wanted to share our wonderful goat milk products with others and decided to do just that. We offer goat milk products for all ages. We handcraft all of our creams, lotions, balms, butters and sugars to order using only the finest purest natural ingredients. We believe in living healthy, naturally and enjoying life to the fullest here on our farm."